I have posted below the entire service. During the service, I try to explain some of the conventions that described a Puritan church service. You may be surprised to know that the Puritans were highly experimental during church services. Different structures and approaches were commonplace. But the nature of Congregational polity and the dissident status of the early Pilgrims and Puritans also defined the way a service was organized. I will figure out how to get sermons transcribed soon since I have not written out manuscripts for the last two weeks. Peace and blessings to you all this Thanksgiving week! Thus ends our exploration of the 10 Commandments and the Lord's Prayer. I do not have a text for you this week, and nor do I have a mind-map. Instead, I tried a new technique for navigating the sermon. The new technique is actually a very ancient memorization technique which uses a familiar building, mnemonic devices and creative imagery to move through the ideas expressed. It is the way the Ancient Greek philosophers and publicans memorized speeches. So I have an audio here. If you would like me to explain the pathway I used, I can do that. Please email me at revsdjones@ne.twcbc.com. Peace and blessings to you all! 11/10/2013 -- The Ninth Commandment: You shall not bear false witness against your neighbor. 11/03/2013 -- The Eighth and Tenth Commandments: You shall not steal your neighbor's stuff; You shall not covet your neighbor's stuff. 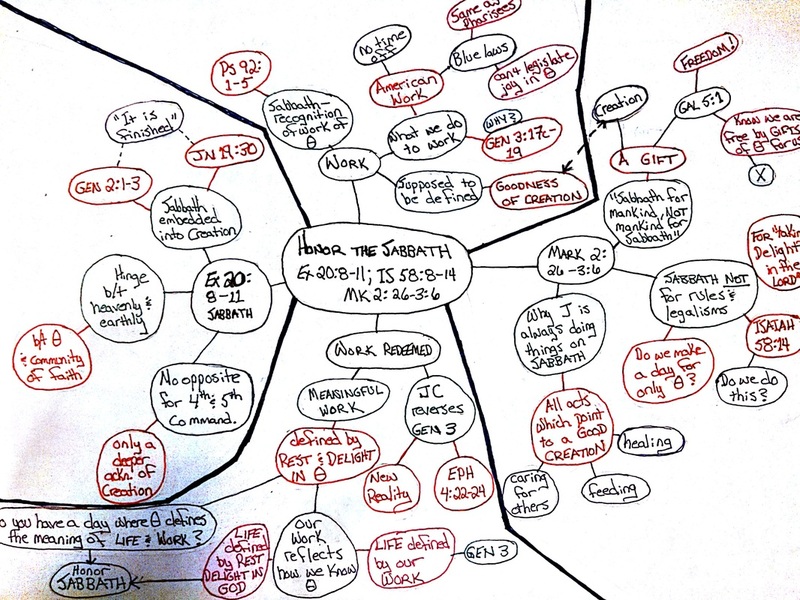 No manuscript this week, but I did upload my map for the sermon. You can follow along and listen to the audio below. Thanks! Occasionally, on 5th Sundays of the month, I will do an "Ask the Pastor" Sunday, where people ask any question they want, and we have a discussion on it. Sometimes, if my daughter asks a question, "Ask the Pastor" becomes "Stump the Pastor" Sunday. Anyway, enjoy! This week, I used a mind-map again, and this time I think I put it in right-side up. If you want to follow along, start at the far left, and then everything moves clockwise. Smaller circles move clockwise around larger circles and represent ideas from the larger circle. Enjoy! This week I used a mind-map again. It is linked as a PDF above. If you want to follow the map, start at the left, with Exodus 20 and then everything moves clockwise. I must apologize for the quality of the sound. I used a different recording device and it was not right next to me when I made the recording. I will monkey around with it and see if I can improve the quality. Peace! We still haven't got beyond the First Commandment. This is the second part of last week's sermon. Next week we will get into the Second Commandment. Audio is below. Enjoy! Last weekend, we dropped our daughter, Rhiannon, off at college. The very capable congregation of Rockland Congregational Church ran the service while we were gone. This week, we started on the First Commandment. I have divided our discussion on the First Commandment into two weeks, because it is the foundational commandment for all the others. This week we began our series on the 10 Commandments. I only have a copy of my notes that I used, no text of the sermon, for this week. One day, I will transcribe these for you. For now, however, I only have notes and the audio below. Please enjoy!